General Plastics’ LAST-A-FOAM® FR-3700 is not your typical packaging peanut. As a versatile polyurethane product protecting very hazardous cargo, our FR-3700 foam is carefully engineered for diverse scenarios ranging from pool fires to high speed crashes. For aerospace technology, the flame-retardant material is integrated into everything from structural aircraft interiors, to weatherproof randomes. Even in the medical field of orthopedics, FR-3700 simulates human bones as artificial media for implant testing, and is used by medical students to sharpen their surgical skills. The application for which the FR-3700 undergoes the most rigorous testing, however, is the transportation of hazardous nuclear materials. Even when subjected to the strictest regulations, the material continues to prove its worth time and time again. Every year, roughly 3 million packages of radioactive materials are shipped within the United States from source to storage. The containers that carry the spent fuel rods must be able to withstand extreme conditions, including mechanical and thermal accidents. Our product, FR-3700, is one of very few materials that can support radioactive materials (RAM) packaging guidelines. The Nuclear Regulatory Commission (NRC), the governing body responsible for the safety of nuclear transport, has a zero-tolerance policy for humans contacting nuclear waste during transport, and has penned proper transportation procedures for RAM. NRC regulations include “crash and fire protection,” requiring RAM packages to withstand 1,475°F, 30 minute fire conditions, and 30-foot free-drops. To simulate fire conditions, an FR-3700-lined stainless steel container is placed in an ignited pool of diesel fuel for 30 minutes. When the foam reaches extremely high temperatures, the material forms an expanding char and fills any void created within the container, preventing oxygen from penetrating the payload and exploding. In another test that’s small in size but big in results is the coin drop test, where high-intensity impact scenarios are replicated. The coin drop test was developed to demonstrate our product at trade shows. The components are simple: a quarter, a 1” block of FR-3700 foam, and a 50 lb. plunger. 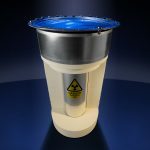 The quarter is placed on the 1” block of foam to represent the radioactive payload, and both are placed beneath a 50-pound metal plunger. The plunger is then lifted two feet (representing 100 ft lbs. of energy), before it is dropped on the quarter and foam. Because it is a federal offense to damage US currency, our foam must completely cushion the force of the plunger and protect the coin. When the plunger drops, the coin is driven deep into the foam, depressing it by 50%. This depression is precisely what we at General Plastics strive for, as it demonstrates a diffusion of the force, protecting the payload. Our flame-retardant, CFC-free, chemically-resistant polyurethane foam has traveled to space, provides artificial bone media for medical labs, and protects the public from hazardous radioactive materials, all as a result of our careful engineering and rigorous testing. Think about FR-3700’s merits the next time you need to transport spent nuclear fuel rods. If you’d like to learn more about the FR-3700, the coin drop test, or any of our other testing services, give us a call or visit us online.